Publisher: New York Review Books. Country: United States. Date: 1999- . 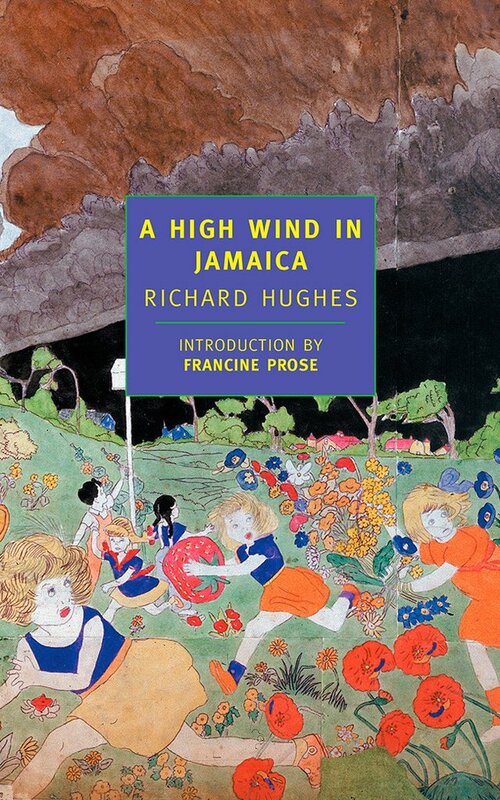 A High Wind in Jamaica by Richard Hughes. New York, New York Review Books, 1999 (NYRB Classics). "Richard Hughess celebrated short novel is a masterpiece of concentrated narrative. Its dreamlike action begins among the decayed plantation houses and overwhelming natural abundance of late nineteenth-century Jamaica, before moving out onto the high seas, as Hughes tells the story of a group of children thrown upon the mercy of a crew of down-at-the-heel pirates. A tale of seduction and betrayal, of accommodation and manipulation, of weird humor and unforeseen violence, this classic of twentieth-century literature is above all an extraordinary reckoning with the secret reasons and otherworldly realities of childhood." Series Note: "The NYRB Classics series is dedicated to publishing an eclectic mix of fiction and non-fiction from different eras and times and of various sorts. The series includes nineteenth century novels and experimental novels, reportage and belles lettres, tell-all memoirs and learned studies, established classics and cult favorites, literature high, low, unsuspected, and unheard of. NYRB Classics are, to a large degree, discoveries, the kind of books that people typically run into outside of the classroom and then remember for life. Literature in translation constitutes a major part of the NYRB Classics series, simply because so much great literature has been left untranslated into English, or translated poorly, or deserves to be translated again, much as any outstanding book asks to be read again. The series started in 1999 with the publication of Richard Hughess A High Wind in Jamaica and by the end of 2015, over 400 titles will be in print. NYRB Classics includes new translations of canonical figures such as Euripides, Aeschylus, Dante, Balzac, Nietzsche, and Chekhov, as well fresh translations of Stefan Zweig, Robert Walser, Alberto Moravia, and Curzio Malaparte; fiction by modern and contemporary masters such as Vasily Grossman, Mavis Gallant, Daphne du Maurier, Kingsley Amis, Sigizmund Krzhizhanovsky, Wlliam H. Gass, John Williams, and Patrick Leigh Fermor; tales of crime and punishment by George Simenon, Kenneth Fearing, and Jean-Patrick Manchette; masterpieces of narrative history and literary criticism, poetry, travel writing, biography, cookbooks, and memoirs from such writers as Norman Mailer, Lionel Trilling, and Charles Simic; and unclassifiable classics on the order of J. R. Ackerleys My Dog Tulip and Robert Burtons The Anatomy of Melancholy. A few of our 2015 publishing highlights are Magda Szabós The Door, Eileen Changs Naked Earth, and Sybille Bedfords A Legacy. Published in handsome uniform trade paperback editions, almost all NYRB Classics feature an introduction by an outstanding writer, scholar, or critic of our day. Taken as a whole, NYRB Classics may be considered a series of books of unrivaled variety and quality for discerning and adventurous readers. From postwar Budapest to remote Scandinavia, explore Europe through the work of these European writers. Six novels depict the lives of ordinary soldiers and citizens in the grips of war. These three anti-war novels offer urgent and distinct visions of the Great War. As temperatures rise, these spine-tingling, bone-chilling tales will keep you cool ... and riveted. Pitch-dark page-turners, these noir classics deserve to be read time and again, now and forever. From sea to shining sea, these novels are quintessentially American: audacious, far-reaching, and deeply human. Full of suspense, espionage, action and adventure, this collection of thrillers bring the genre to the global stage. Whether read separately or in a sequence, each book presents a singular snapshot of the collapse of British colonial rule. Get philosophical every day of the week with these thought-provoking essay collections. Traveling across Europe with some of the best writers as guides. Masterful works of gardening writing, sure to please everyone from the casual backyard tomato grower to the dedicated horticulturalist. The New York Review of Books, Vol. LXV, No. 13, August 13 - September 2018, pp. 40-41, "Summer Sale" display advertisement.